This C#.NET Postnet barcode generator library allows developers and end users to easily draw and customize Postnet barcode on common image and document files, including PNG, BMP, GIF, JPEG, TIFF, PDF, Excel, PowerPoint and Microsoft Word. It also empowers C#.NET developers to specify the location of generated Postnet barcode in a target file. RasterEdge C#.NET Barcode Creator Add-on can be seamlessly combined with image processing and management system so that users are able to process and edit created barcode image in color, black and white or grayscale. Particular barcode image manipulation functions contain resizing, printing, saving and more. You can easily generator POSTNET barcode and save it to image files/object using this C#.NET barcode generator control. 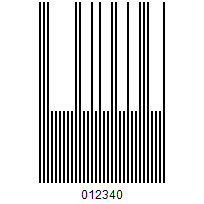 The following steps will show how to create a POSTNET type barcode encoding numeric data text "01234" into the image object with XImage.Barcode.Creator. Please copy the sample code as follow to generator a POSTNET barcode. Using this C#.NET Postnet barcode generator library, you can generate & draw Postnet barcode on png, gif, jpeg and bmp image files. Besides, you can generate Postnet barcode at the specified location of source file. If you want to generate Postnet barcode on a single-page or multi-page document files in C#.NET application, like PDF, Word, Excel, PowerPoint and TIFF, this Postnet Barcode Creator Add-on of RasterEdge DocImage SDK for .NET is quite suitable. Following C# code contains all above mentioned barcode generating parameters and you can use it to generate a customized Postnet barcode on a png image file.